Legendary Bengali actor Soumitra Chatterjee was on Tuesday presented France’s highest civilian award, Legion d’Honneur at a function here. French Ambassador Alexandre Ziegler presented the medal to the versatile octogenarian, who has delved into multiple cultural genres. Apart from his chief vocation of acting, he has also dabbled in painting, composed poems, written and directed plays, edited a Bengali magazine and is also a much-acclaimed elocutionist. Ziegler said the award was being given in recognition of Chatterjee’s remarkable career, his outstanding contribution in promoting Indian cinema in France and his long-standing attraction “for our country”. “France loves you, as much as you love France,” he said, mentioning many retrospectives of his films heve been organised in his country. He also recalled that in 1990 Chatterjee acted in Satyajit Ray directed “Sakha Prosakha”, which was an Indo-French production. In 1999, Chatterjee became the first Indian actor to receive the ‘Officier des Arts et Metiers’, the highest award for arts given by the French government. Chaterjee said as a student of literature, his first association with France was through its “glorious and magnificent” literature. “And later on, when I got interested in cinema, French cinema, and also the great painters, particularly the impressionists, have fascinated me all along. “I recall all this only to remember what amount of bond we have with France. Therefore, coming from a country like France, this honour simply overwhelms me. “I don’t know what I have done to deserve it. But I will honour it throughout my life, and I pledge to do as much as I can to enhance it,” he said. In 1987, auteur Satyajit Ray was honoured with the coveted Legion d’Honneur by then French President Francois Mitterand during his visit to Kolkata (at that time called Calcutta). 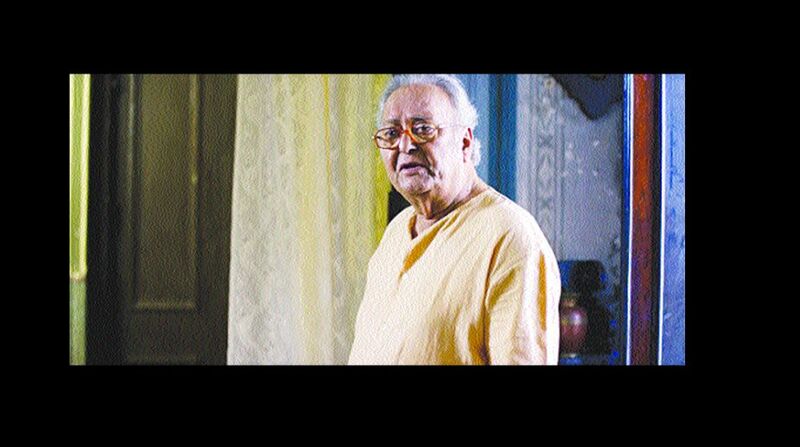 Chatterjee is arguably the most prominent face of Ray’s films, and the director’s most favoured actor. Making his movie debut in Ray’s masterpiece “Apur Sansar” (the world of Apu) – the third part of the Apu Trilogy – in 1959, Chatter jee has acted in over 90 films till date. He is a recipient of the country’s third highest civilian honour Padma Bhushan (2004) and India’s highest award in cinema Dadasaheb Phalke (2012).